There has been a sharp reduction in the number of ships seized by pirates off Somalia in December, the International Maritime Bureau says. Despite a large number of attacks, only two ships were hijacked last month, the bureau's director told the BBC. Among the latest incidents, an Egyptian cargo ship was seized off Somalia and a Malaysian military helicopter saved an Indian oil tanker from a pirate attack. 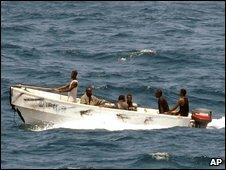 There were more than 100 pirate attacks in 2008 off the coast of Somalia. "There have been many attempted attacks but there were only two vessels which were hijacked in December," Capt Pottengal Mukundan, the director of the International Maritime Bureau (IMB), told the BBC. But on the first day of 2009, the Egyptian Blue Star, carrying 6,000 tonnes of fertiliser, was hijacked as it travelled south out of the Red Sea and into the Gulf of Aden, the Egyptian foreign ministry said. About 15 pirates, some of them heavily-armed, seized the ship and its crew of 28 and then steered the vessel towards the coast of Somalia, Egyptian Deputy Foreign Minister Ahmed Rizq said. "The crew are hostages... there are efforts underway to conduct the necessary talks to free the ship," he said. Another pirate attack on Thursday was unsuccessful, the IMB said. Two boats carrying armed men approached an Indian oil tanker, firing on the vessel, the IMB's Noel Choong told Associated Press news agency. The pirates, believed to be Somalis, fled after a nearby Malaysian navy frigate picked up the tanker's SOS signal and sent a helicopter to the scene. A number of countries have now sent navy ships to patrol the Gulf of Aden and the Indian Ocean in order to protect cargo vessels in one of the world's busiest sea lanes. The International Maritime Bureau (IMB) says 42 ships were successfully hijacked last year and that 14 of those are still in pirate hands, including the Saudi oil tanker the Sirius Star - hijacked in mid-November. Capt Pottengal said it would be necessary to target the pirates' mother ships in order to deter further attacks.